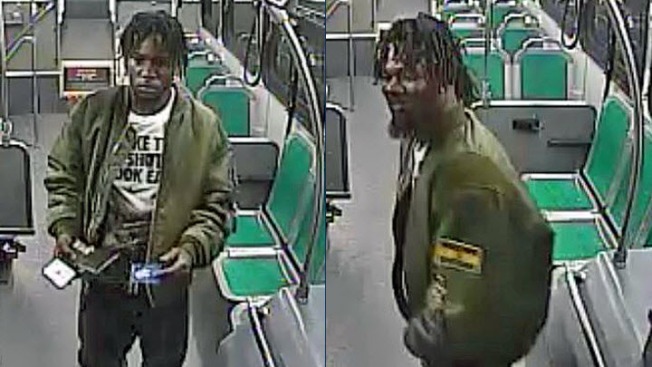 BART officials on Tuesday released images of an at-large suspect in a killing early Saturday morning at the agency's Bay Fair station in San Leandro. The suspect is described as a black man, 5 feet, 8 inches to 5 feet, 10 inches tall, with a medium build and dark complexion. BART officials said the suspect has shoulder-length dreadlocks in a ponytail and a scruffy beard. He was allegedly wearing a white T-shirt and a green jacket. BART officials said according to video from the train and station, the suspect hit his victim on the side of the head with a closed fist. The victim, identified as 47-year-old transient Don Stevens, fell on the cement of the platform at about 1:20 a.m. Saturday. BART police found Stevens and tried CPR until firefighters and paramedics arrived. Stevens was taken to a hospital with a pulse but later was declared brain dead. Stevens' death is just one of three homicides on the BART system in a span of less than seven days. Nia Wilson's death Sunday night at the MacArthur station sparked a march of about 1,000 people Monday in Oakland. Six Oakland police officers were injured in a melee following the march and police have started an investigation to determine who is responsible for injuring the officers. Wilson, 18, was stabbed to death by a suspect BART police have identified as John Lee Cowell, 27, who was arrested Monday evening. A third homicide occurred Wednesday, when a 50-year-old man was attacked at the Pleasant Hill/Contra Costa Centre station. In the attack, the man suffered a bloody lip and a cut to the back of his knee and he died Friday because of an infection. Anyone with information about the death of Stevens is asked to immediately call BART police at (510) 464-7011.